* Packaged & sold by each * MSRP: $650.95/ea * HCPCS code: K0001 ELR'S 50195 * 275lb. weight cap * Overall weight: 49lbs. * Reclines to full 180 degree position * "Easy Adjust" foot riggings * Sealed wheel bearings * Flame retardant nylon upholstery * Anti-tippers & head pillow included * Replacement anti-tippers: NOV-S6000AT * Industry compatible accessories * Limited lifetime warranty on frame * Overall dimensions: 49"l x 24.25"w x 36.5"d * Overall dimensions folded: 49"l x 12.5"w x 36.5"d * Seat to floor height: 20 * Arm height from seat: 8.5" * Back height from seat: 30" * Overall width open: 23.5" * Overall width closed: 12.5" * Seat dept: 16" * Width between arms: 16.25"
* Packaged & sold by each * MSRP: $670.95/ea * 20" detachable full arm w/elevating leg rest * HCPCS code: K0001 * Weight capacity: 325 lbs. * Overall weight: 51lbs. 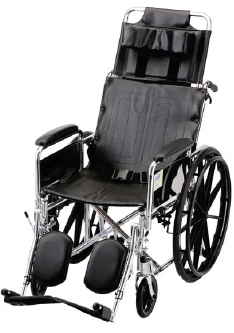 w/o footrest * Reclines to full 180 degree position foot riggings * Sealed wheel bearings * Flame retardant nylon upholstery * Anti-tippers & head pillow included * Replacement anti-tippers NOV-S600AT * Industry compatible accessories * Limited lifetime warranty on frame * Seat width: 20" * Seat depth: 17.5" * Seat to floor height: 20" * Arm height from seat: 8.5" * Width between arms: 20.25" * Back height from seat: 30" * Arm height from floor: 28.5" * Seat depth: 16" * Overall dimensions: 49"l x 28.25"w x 36.5"d * Overall dimensions folded: 49"l x 12.5"w x 36.5"d * Overall width open: 27.5" * Overall width closed: 12.5"
* Sold by each * MSRP: $850.00/ea * HCPCS code: K0001/E1226(recliner back) * Wt. cap: 300lbs. * Removable full support headrest * Detachable desk arms * Hammer tone finish provides durability & style * Anti-tippers standard * Anti-fold bar standard * Seat width: 18" * Seat depth: 17" * Back height: 23" * Overall depth: 34" * Overall height: 51" * Overall width: 28 1/2" * Width folded: 11 1/2" * Unit weight: 53lb. * Sold by each * MSRP: $855.00/ea * HCPCS code: K0001/E1226(recliner back) * Wt. cap: 300lbs. * Removable full support headrest * Detachable desk arms * Hammer tone finish provides durability & style * Anti-tippers standard * Anti-fold bar standard * Seat width: 16" * Seat depth: 17" * Back height: 23" * Overall depth: 34" * Overall height: 51" * Overall width: 26 1/2" * Width folded: 11 1/2" * Unit weight: 53lb. * Sold by each * MSRP: $860.00/ea * HCPCS code: K0001/E1226(recliner back) * Wt. cap: 300lbs. * Removable full support headrest * Detachable desk arms * Hammer tone finish provides durability & style * Anti-tippers standard * Anti-fold bar standard * Seat width: 20" * Seat depth: 17" * Back height: 23" * Overall depth: 34" * Overall height: 51" * Overall width: 30 1/2" * Width folded: 11 1/2" * Unit weight: 53lb.